Big stories, big fun: Children’s Festival of Reading 2013 | Oh, the Places We See . . . 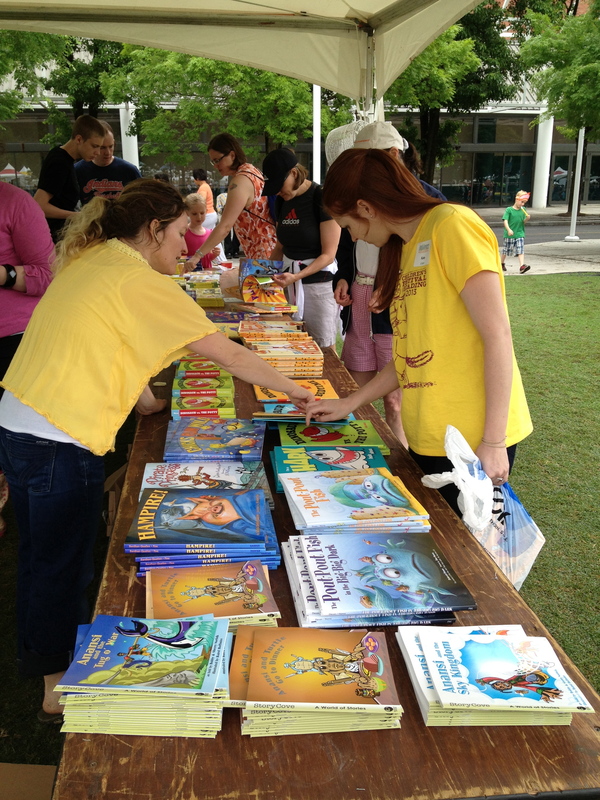 There was no silent reading at the Children’s Festival of Reading sponsored by the Knox County Public Library! In fact, with more than 20,000 people in attendance, you could hardly hear yourself read aloud, even if you wanted to! 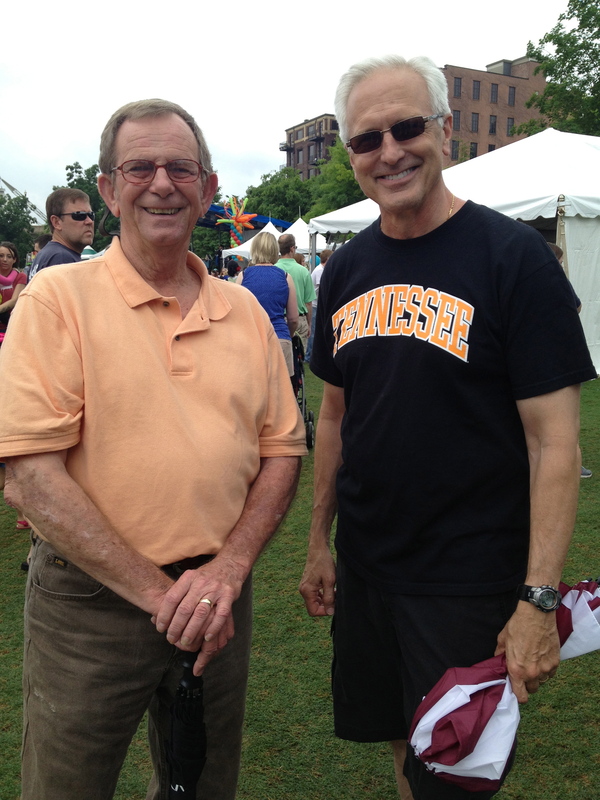 It was a two-festival day in Knoxville. 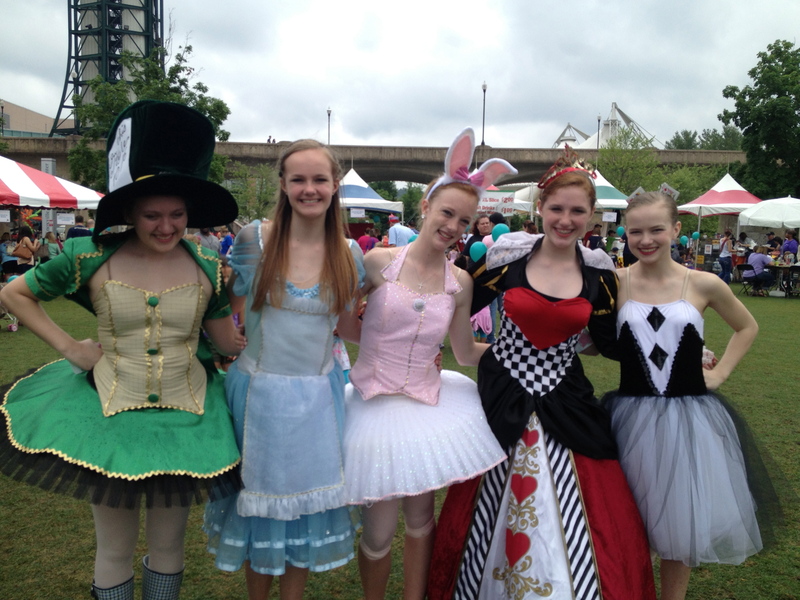 We stuffed ourselves at the International Biscuit Festival the morning of May 18th (Click here to read post), and then walked down to Knoxville’s World’s Fair Park for the Reading Festival. 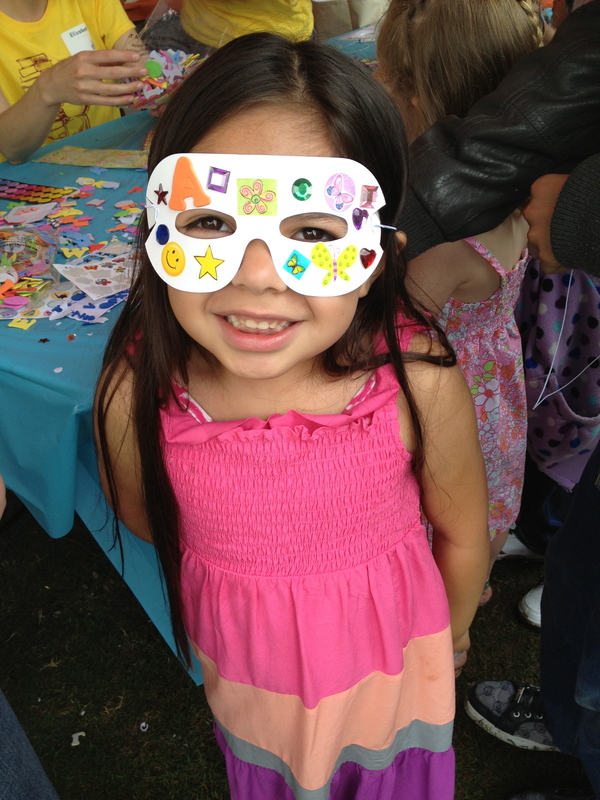 With celebrities like Curious George and kids dressed in their very best Alice in Wonderland attire, the day was a rollicking, fun-filled, noisy-in-a-good-way celebration of reading! The Junior League set up Kids in the Kitchen for cooking demonstrations, gardening-with-kids ideas, and afternoon cook-offs. 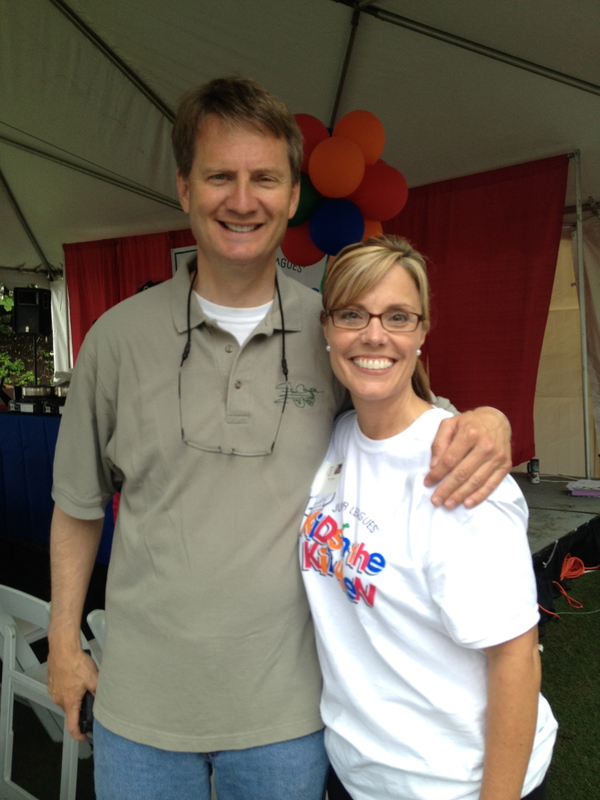 We snapped this picture of Knoxville’s mayor Tim Burchett who led the Parade of Books that morning with Tracy Morrow, the League’s Executive Director. Attendance has been great today, she told us. You just missed the demo with Heather Kyle of UT Extension. 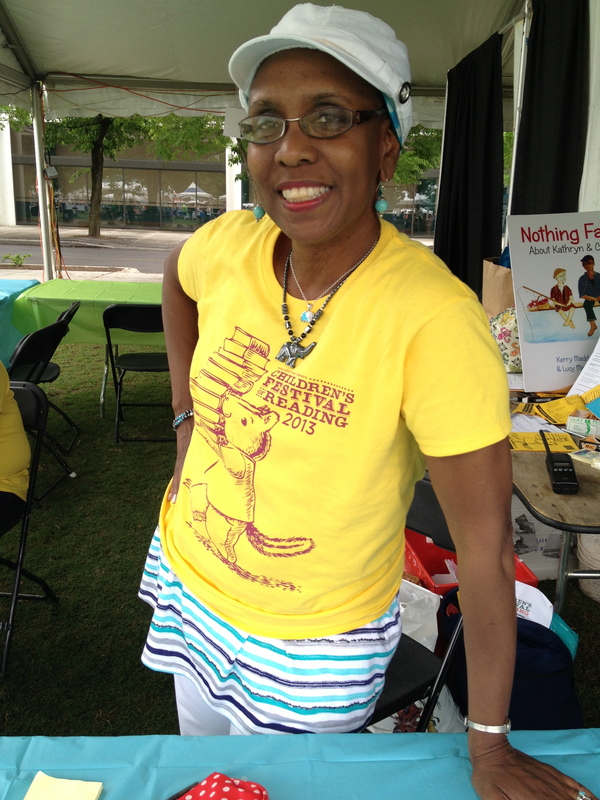 Fellow educator, Donna Hardy, chatted with us as she waited for the return of featured author Sharon Draper to their tent. Draper, five-time winner of the Coretta Scott King Author Award, is well-known for books for teens — the “Jericho” and “Hazelwood” trilogies and her bestseller Out of My Mind. We walked the expanse of the park and saw people buying (what else?) books, of course. And listening to a panel of authors talk about where they get ideas for writing. Some kids created crafty things that corresponded to their favorite books, like this mask at the table where Bill the Boy Wonder: The Secret Co-Creator of Batman by Marc Tyler Nobleman was featured. Other kids (adults, too!) showed off their shirts and acrobatic talents. 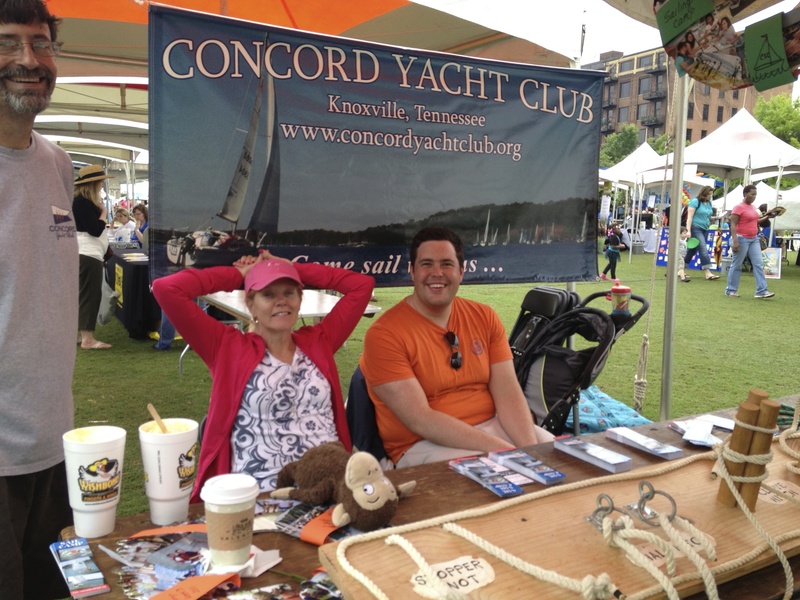 Or learned the art of knot-tying at the Concord Yacht Club booth. 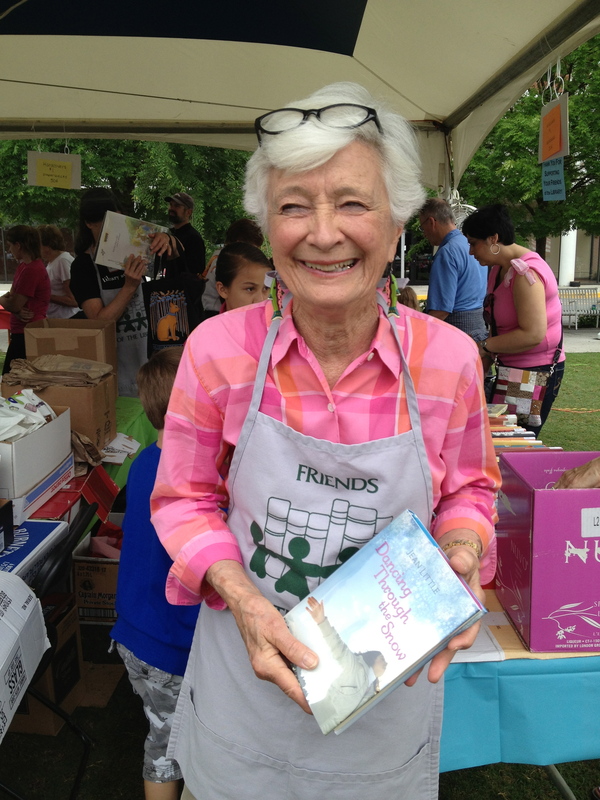 Julie Webb, one of Knoxville’s most dedicated volunteers, “manned” the used book tent. (Her warm smile draws you into whatever she’s promoting.) She even got us to sign up for Friends of the Library! 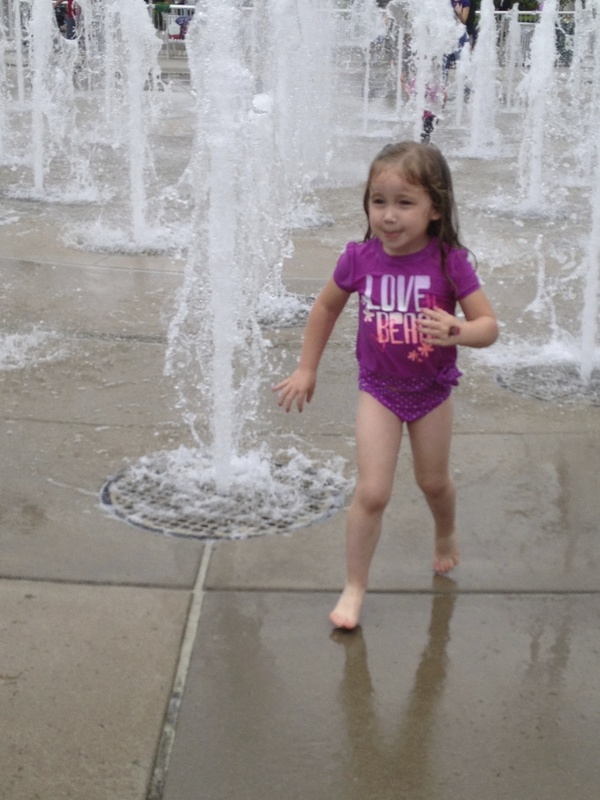 And some children, like my granddaughter, just wanted to play at the splash pad at the World’s Fair Park! Reading would come later — in the car, at home, at bedtime . . . 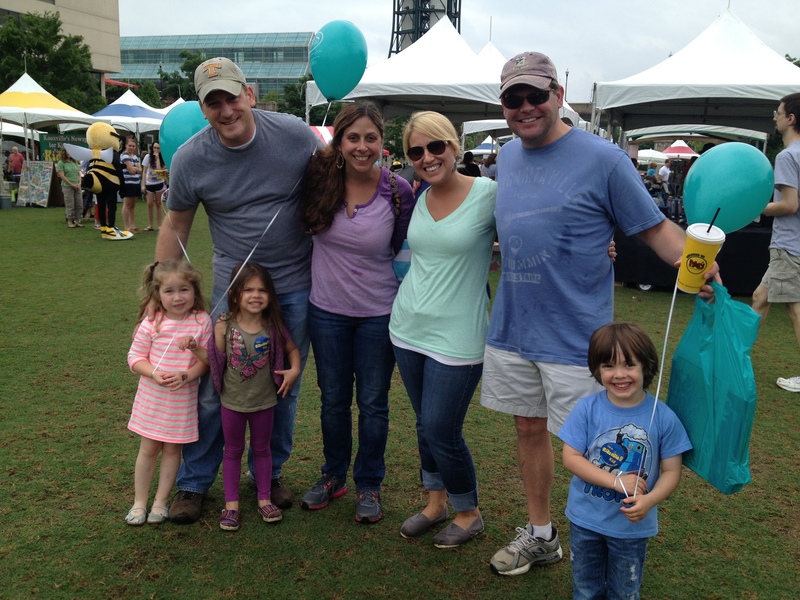 The Children’s Festival of Reading — a great day for families all revolving around the wonderful world of books! Have you signed up YOUR kids for Summer Reading yet? 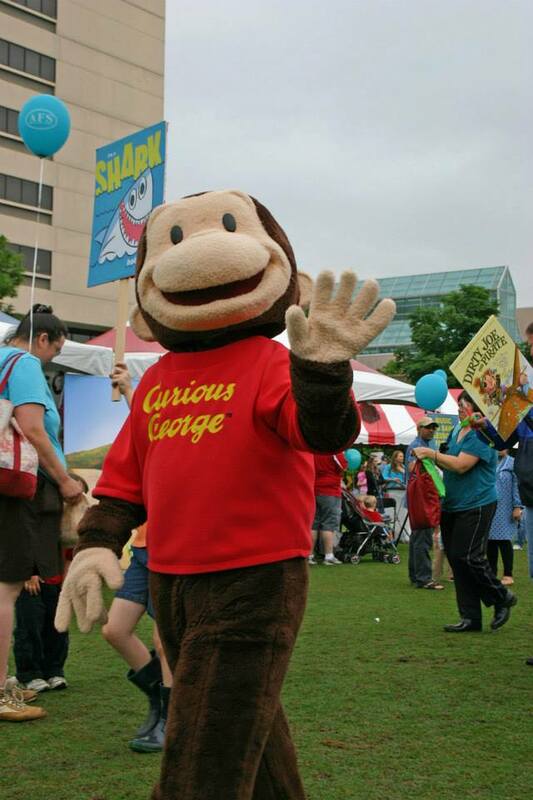 Click here for “Children’s Festival of Reading promotes literacy for fun” by Amy McCrary (Knoxville News-Sentinel, May 10, 2013). 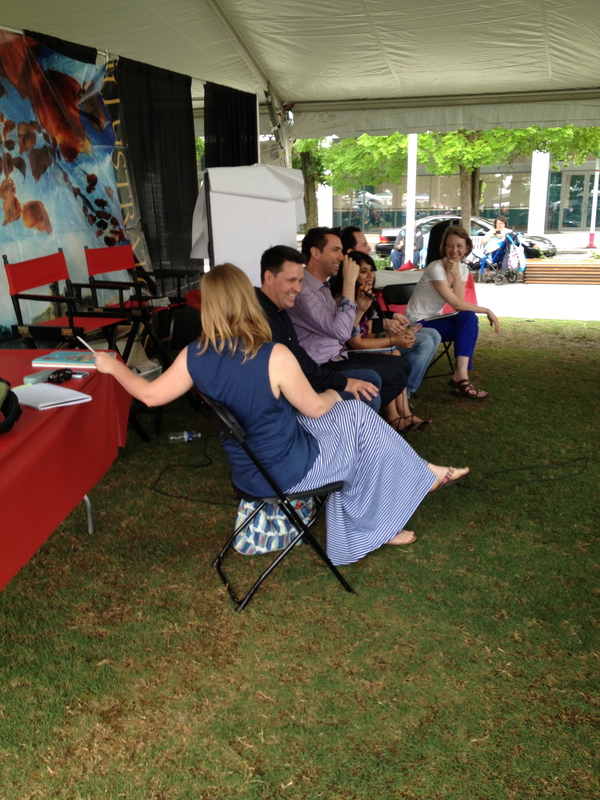 Click here for “Big names, big fun at Children’s Festival of Reading” by the Knoxville News-Sentinel staff (May 16, 2013). This entry was posted in Tennessee, Travel and tagged Children's Festival of Reading, Knox County Public Library, Knoxville, library, reading. Bookmark the permalink. Love, love these picture! They are adorable 🙂 Thanks, Rusha! Thanks so much for taking a look at my blog and commenting! It means a lot! You’re right! 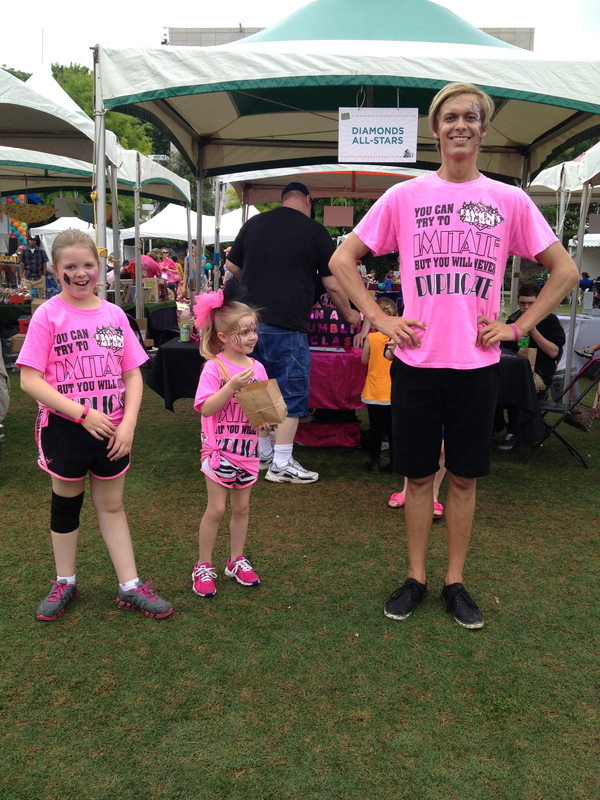 We only were there half a day since we went to the Biscuit Festival the first half. Would love a whole day to enjoy storytellers, etc. Thanks for reading & commenting!